In the now familiar fashion, the Hammermen enjoyed a fabulous evenings entertainment at the Golden Lion on the Anniversary of Robert Burns visit to the Golden Lion in August 1787. Deacon Stuart Campbell chaired the proceedings with Baillie Andy McEwan setting the tone of the meeting by giving a rousing Address to the Haggis. Baillie Ken Johnston said Grace and after the meal Douglas Mulholland gave a very thoughtful, different but witty Immortal Memory. A musical interlude followed from local musician Dougal Thornton, who sang some famous songs penned by Burns. David Sibbald then went on to give a rendition of Tam ‘O’ Shanter followed by an amusing animated performance of The Touchstane by Ebenezer McIlwham, which he completed despite being taken completely off guard by the flash from the photographers camera at crucial part of the rendition. Deacon Stuart then rounded off the evening with a very unusual toast to the City of Stirling. 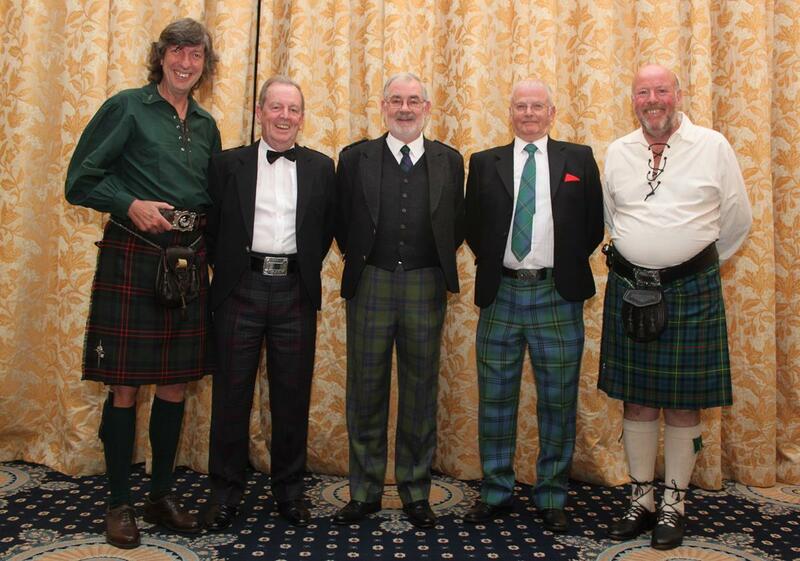 Pictured (L-R) are David Sibbald, Douglas Mulholland, Deacon Stuart Campbell, Baillie Ken Johnston and Baillie Andy McEwan.